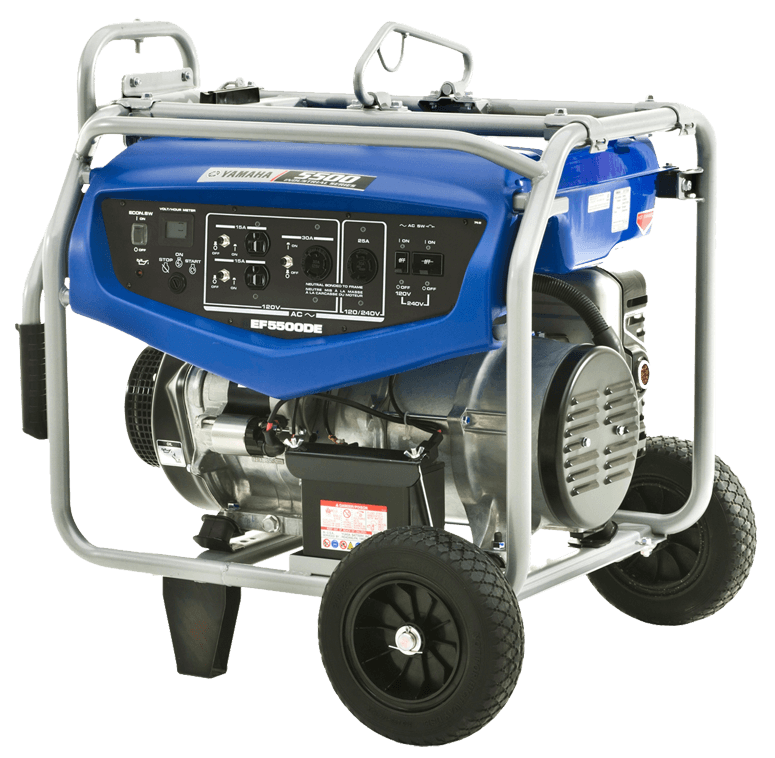 Introducing the all new EF5500DE gas powered generator. 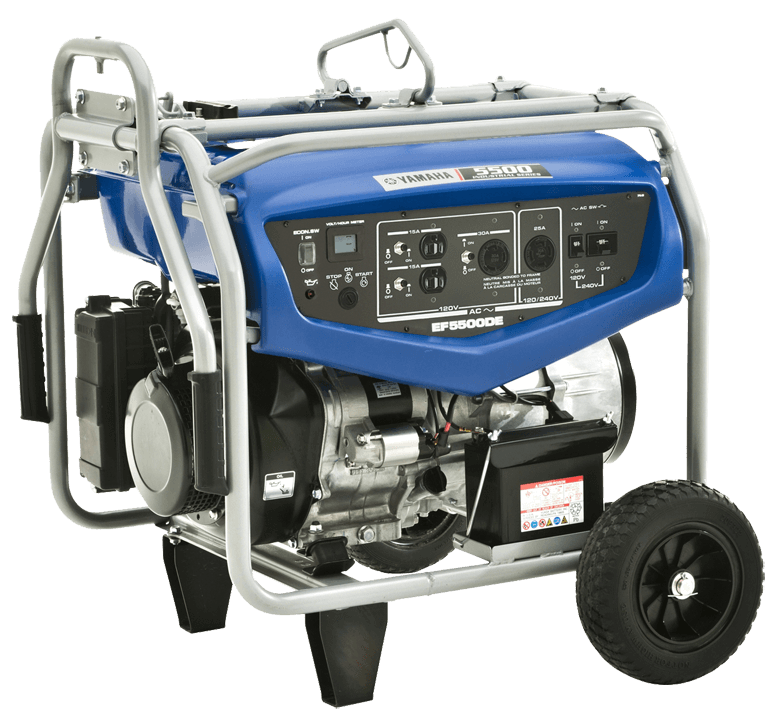 This versatile dual 120/240 volt unit is ideal for emergency backup power for home, cottage or business. 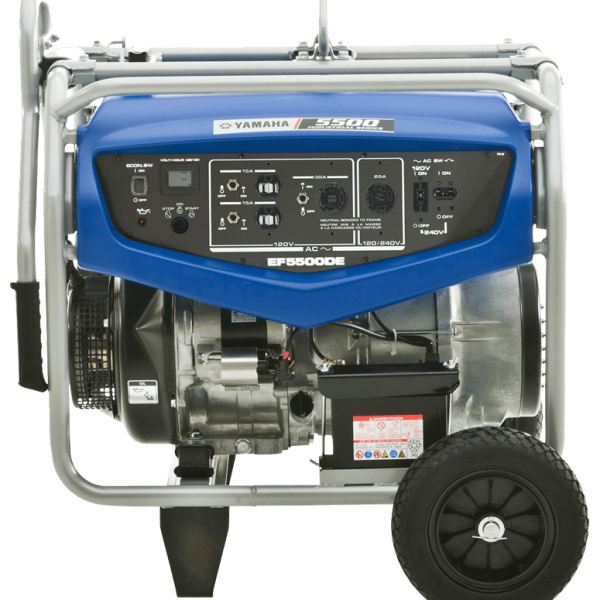 It can also be used as a primary power source on job sites too. 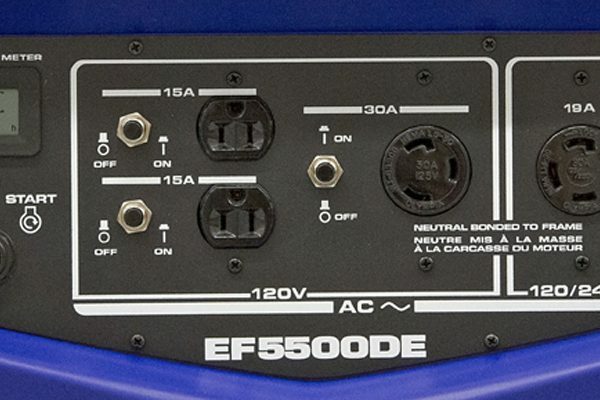 Easy to use and easy to move, the EF5500DE sets new standards for performance and value. Powered by Yamaha’s MZ360; 358cc, air-cooled (fan assist), OHV, 2-valve, 4-stroke, single cylinder engine with transistor controlled (TC) ignition. Lightweight piston and offset cylinder design reduce frictional losses for improved fuel economy. 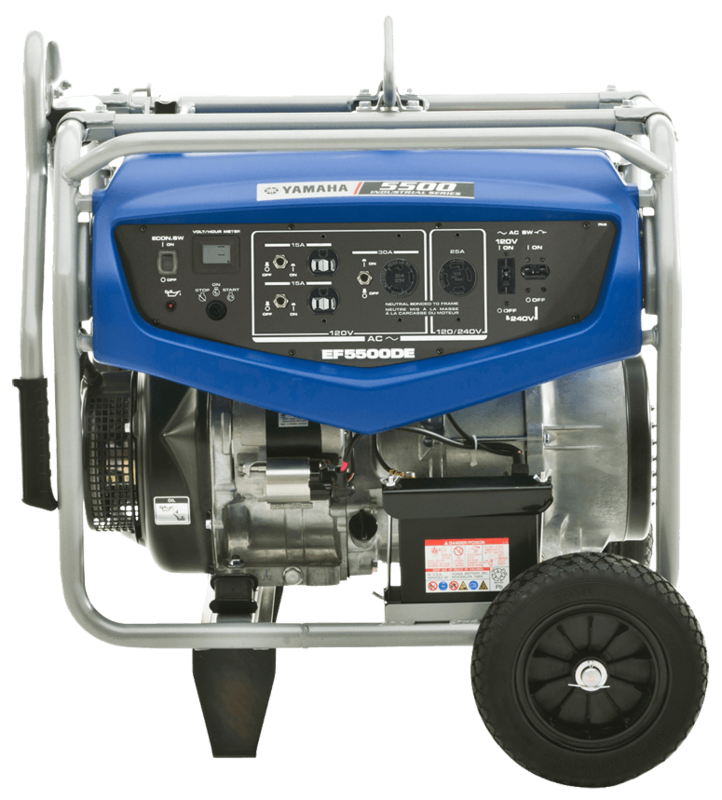 Electric starting backed up by manual recoil with an auto decompression system for a light recoil starter pull. Maintenance-free brushless alternator offers superior reliability and reduced maintenance. Non-fuse type circuit breaker (NFB) prevents internal circuit damage in the event of an over load. Economy Control System (when turned on) lowers the engine rpm when there is no load to conserve fuel and reduce noise and engine wear. Yamaha’s Oil Watch Warning System automatically shuts off the engine when oil level is low and will not re-start until oil is added, preventing costly engine damage and enhancing long-term durability. Electrical “noise” suppressor reduces electrical interference with TVs and radios. 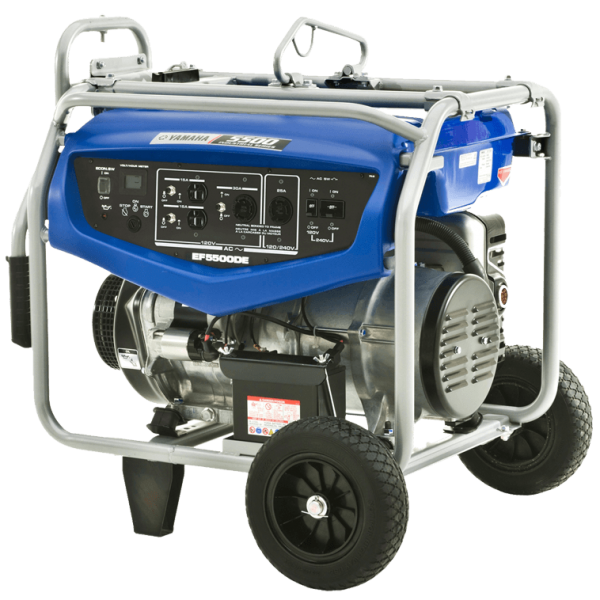 On-off fuel petcock lets you shut off the gas to run the carb dry for storage, helping to prevent stale fuel problems, which are becoming more common with ethanol based fuels. Rubber vibration isolation mounts reduce vibration for smoother operation and reduced noise. 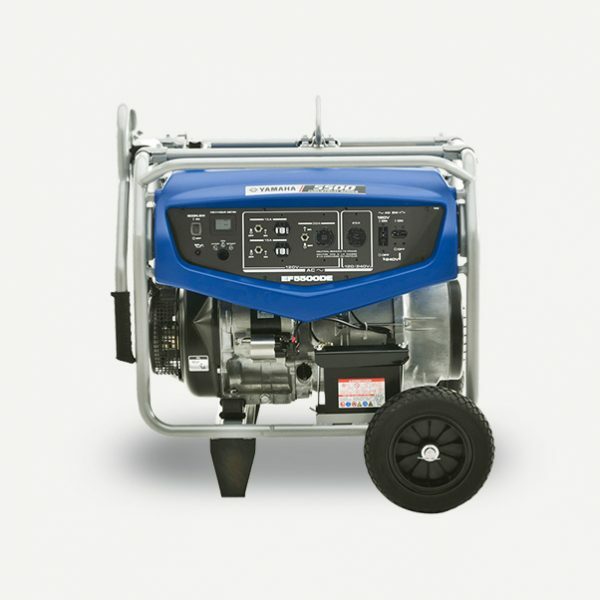 Rugged perimeter steel frame protects the generator, engine and battery from damage. Never flat, non-pneumatic tires mounted to rugged steel axles. Low maintenance MF style battery is included. Battery is positioned inside the frame for extra protection. 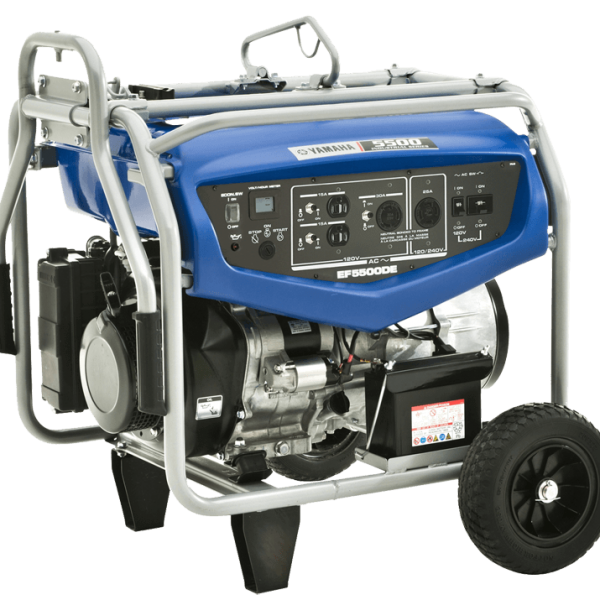 Maintaining your battery’s state of charge during extended periods of storage is essential to insure the maximum service life. Any battery, regardless of the type, should be charged (with the correct type of charger) at least every 2 months when not being used.